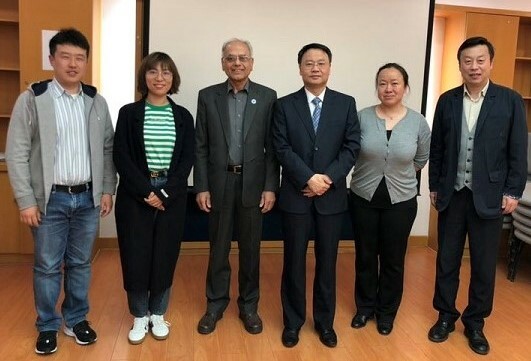 Prof. Manzoor H. Soomro, President ECOSF visited the Secretariat of Belt and Road International Science Education Coordinating Committee (BRISECC) on 27 March 2019 in Beijing, China. The Secretary of the BRISECC Mr. Liu Yang who is also Member, warmly welcomed Prof. Soomro at the Secretariat. During the meeting, Prof. Soomro met with the Secretary and Members of the BRISECC and discussed the action plan for 2019 and beyond for capacity building of science instructors and teachers of the countries along the Belt and Road. It is imperative to share that Prof. Manzoor is founding Vice President of BRISECC. Mr. Yang highly appreciated the contribution of ECOSF for establishing BRISECC and chalking out a comprehensive plan for training of science instructors and teachers. At the end, President ECOSF also presented the Five Year Report of ECOSF to Mr. Liu Yang for information and any future use for BRISECC and other initiatives to be taken in B&R. The souvenirs were also exchanged.